Dream to Dram is the first generally available single malt whisky from Kingsbarns Distillery, marking the Wemyss Family’s vision to bring malt whisky distilling to their Fife home. The new release is a locally made dram, having been slowly crafted with barley harvested from the fields of East Fife. It follows a limited release of ‘Kingsbarns Single Malt Founders Reserve’ for members of the Kingsbarns Distillery Founders Club in December. Owners William and Isabella Wemyss hosted an event at the distillery – a restored 19th century farm steading – for friends, neighbours and whisky lovers from around the world to celebrate and share a first taste of Dream to Dram as it is shipped global markets. 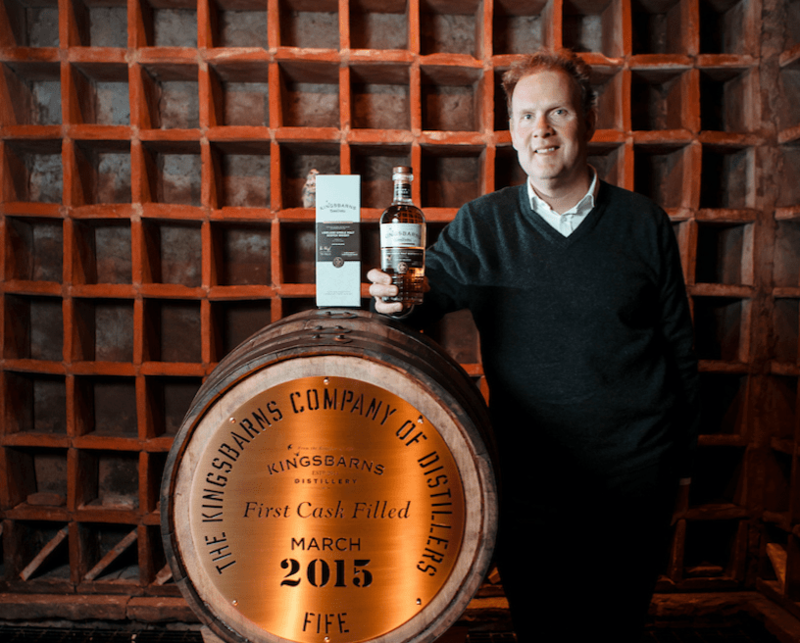 The distillery was officially opened on St Andrew’s Day 2014, with the first whisky laid down in March 2015. Distiller Peter Holroyd has been at the helm of distillation since the beginning. A native of Glasgow, he graduated from the Heriot Watt Brewing and Distilling Course in Edinburgh, working in a number of small breweries before joining the Kingsbarns Team in his first whisky role. Dream to Dram is described as having a complex and distinctive Lowland character: light, intensely fruity, floral and balanced, with colour and richness coming from the wood. On the nose there is banana, pineapple syrup and summer berries, with a slight herbal note. There is soft toffee, custard pastry and redcurrants on the palate, with a finish of ginger syrup. Edinburgh based independent bottler, Wemyss Malts is owned by the Wemyss family. Their family seat is Wemyss Castle in Fife where they’ve lived since the 1300s. Wemyss Malts is primarily known for its range of blended malt Scotch Whisky. The launch follows the latest official figures showing the value of exports increased by 10.8% to £1.97 billion in the first half of 2018. Exports to the European Union (EU) accounted for 31%, making it the industry’s biggest regional destination by value. However, the Scotch Whisky Association (SWA) voiced its unease about the Brexit process this week, repeating its warning that leaving the EU without a deal would threaten the growth of whisky exports. It also expressed concern a no-deal exit could ramp up labelling costs.